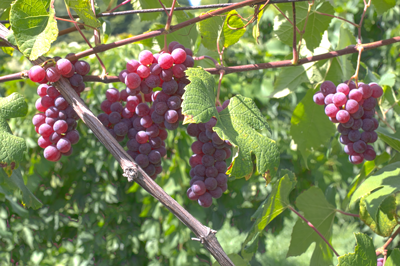 Delaware grape was most likely discovered in Frenchtown, New Jersey and first produced commercially by one George Campbell, of Delaware, Ohio sometime in the 1850’s. Best vine performance is on grafted stock, however can grow on it’s own roots and typically ripens mid to late September on the Fulkerson Farm. Delaware makes a very pleasing wine of good balance and varietal character. Not much “Foxy” character to this variety, which makes it good for spicy champagne styles, as well as sweet and dry still wines. Depending on the growing season, juice can be white to pink in color.